It’s been another productive year for Minerva Canada as we continue to increase health and safety management education by influencing the curriculum of post-secondary institutions to ensure that future business leaders create healthier and safer workplaces. Our ambitious, multi-phased Canada Engineering Student Health and Safety Teaching Modules Project which provides a practical resource to help professors teach this critical topic now boasts the availability of 21 out of 24 modules on our website. A record attendance of 225 engineering professors and 40 participants from industry, government, academia and health and safety associations from regions across Canada participated in our one-day Learning Forums held at Sheridan and Conestoga Colleges in Ontario, the University of Calgary, and the University of British Columbia to discuss how to integrate the vital concepts of health and safety management into the curricula. Our student award activities, aimed at instilling an understanding that health and safety is an integral component of their future responsibilities, continued to generate very strong participation, and this year, with the help of the Chemistry Industry Association of Canada, we have introduced the Minerva – CIAC Responsible Care Case Study Competition. I was also very pleased to see that the University of Regina won top prize this year in both Minerva’s engineering and business student competitions – this is a first for a university. Our many successes are a reflection of the hard work, endless assistance and support from our numerous volunteers from industry, government, academia and H&S professional associations who make up our Board of Directors and Working Groups. I am also very grateful to our many sponsors whose continued support and financial assistance make our efforts at Minerva Canada to advance health and safety education possible. Without this support, Minerva would not exist as an organization. I am also looking forward next year to advance the recommendations made from the Saint Mary’s University study done for us to enhance health and safety education for our Business Schools. Teaching Modules cover a wide range of topics, including Risk Management. With support from our key academic and industry partners, Minerva launched our most ambitious initiative in 2011: the development of health and safety engineering student teaching modules, created to help post-secondary instructors deliver the information so important to Canada’s future engineers and corporate leaders. And we have delivered. The multi-phased $250,000 Minerva Canada Engineering Student Health and Safety Teaching Modules Project now boasts 21 out of 22 modules, available on our website. The wide-ranging topics covered are designed to help future engineers better understand their legal, moral, ethical and societal responsibilities and properly prepare them for the workplace. The modules are also designed to integrate smoothly into existing courses over the four years of undergraduate engineering and assist professors who may lack specific knowledge and confidence when teaching H&S. There is even a voice-over version of the Risk Management presentation, courtesy of the University of Toronto, with more of these in the works for 2017. The project has unanimously been endorsed by the National Council of Deans of Engineering and Applied Science (NCDEAS), The National Council of Deans of Technology (NCDoT), and Technology Accreditation Canada (TAC). Post-secondary institutions from across Canada – Dalhousie, University of Toronto, Ryerson, University of Ontario Institute of Technology, University of Western Ontario, Laurentian, University of Waterloo, University of Manitoba, Queen’s, University of Calgary, University of Alberta, University of British Columbia, and Fanshawe College – were involved in the creation of the modules. Teams comprising engineering professors and grad students developed the modules, alongside industry experts from companies including Nova Chemicals, Trimac, Imperial Oil, Bruce Power, BC Hydro, General Motors, and Shell Canada. Funding has been received from Mitacs, a not-for-profit organization that provides research grants to universities based on an industry need, the Ontario Ministry of Labour, DuPont Canada, Imperial Oil Limited, General Motors, Bruce Power, Nova Chemicals, Shell Canada, Erco Worldwide, BASF, CF Industries, MIRARCO, Canada Post, Chemtrade Logistics, Chemistry Industry Association of Canada, H.L.Blachford, Dow Chemical, Nexen, the Canadian Society of Safety Engineering (CSSE), and the Board of Canadian Registered Safety Professionals. Incorporating Safety into Design (UOIT) completed and under review. Laurentian University is looking at funding to assist in translating the modules into French. In addition, it is planning to create a certificate program using the Modules. Minerva partnership has been established with Waterloo University to develop case studies to complement Minerva Teaching Modules. E-learning versions for the Ethics Module (University of Manitoba) and Lab Safety (University of Alberta) are in the works. A Module on Mental Health in the Workplace is under development by Laurentian University. The next phase of the project is to develop H&S teaching materials for use by business schools. Tours of Sheridan College labs were a feature of the Learning Forum it hosted. Minerva Canada’s 2016 series of four Learning Forums in post-secondary institutions across Canada achieved a record reach. 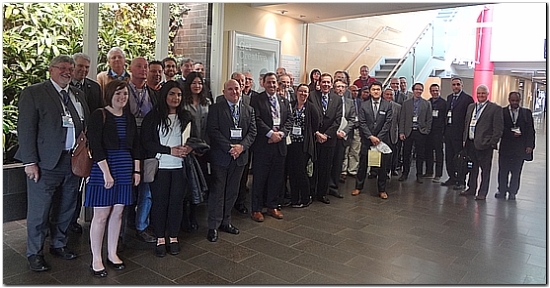 A total of 265 participants from engineering and business schools, industry and government attended the one-day workshops in the spring, hosted by the University of Calgary, Sheridan College in Ontario, Conestoga College in Ontario and the University of British Columbia, to get an introduction to the vital concepts of health and safety management for integration into the curricula. 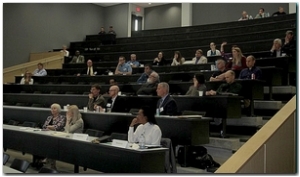 First held in 2004, Minerva’s forums have had close to 1100 engineering and business professors attending. A wide array of presentations from industry, government and academic representatives cover how Safety, Health and Environmental Management (SHE) concepts are being applied in the workplace. The Forums provide an opportunity for professors, graduate students and academics to hear what industry and government seek from new graduates and to network with colleagues from other schools to discuss how best to introduce health and safety management into their program. The Minerva Forum Planning Committee includes members from Minerva’s Board of Directors as well as Minerva’s academic hosts from the four universities and colleges. Ontario Minister of Labour Kevin Flynn. “Accidents are often the result of human error but you can’t regulate this. The solution is to engineer smart by anticipating failure and making adequate allowances in advance.” – Gerard McDonald, Registrar, Professional Engineers Ontario. Gerard McDonald & Tony Pasteris. “We fund Minerva because it does a wonderful job of going back to the source where it can have the greatest impact. Injecting health and safety discipline into the curriculum where it can become part of the DNA of grads will have the greatest impact.” – Kevin Flynn, Ontario Minister of Labour. Graeme Norval & Daniel Liao. “Because there are many labs in colleges, there should be far more info than a quick intro to safety when exposing students to potential dangers.” – Mohame al-Khateeb, Recent Sheridan Graduate and OH&S Coordinator, English Bay Batter. “I had zero training in safety when I left university. In many industries, safety is a sideline – but it’s irresponsible to let people out in the marketplace with no knowledge of the risks to look for. Students need even basic knowledge, and that is in your hands.” – Dan Steringa, Director of H&S, Saputo Canada. “Some instructors think that there is no time to teach this; we have to change the culture in academia. Instructors’ roles are not just to educate, but to change the mindsets and shape the next generation.” – Sandro Perruzza, CEO, Ontario Society of Professional Engineers (OSPE). “Grads need to understand that health and safety is a process involving all kinds of standards, including political, economic, and legal.” – David Thomson, CEO, Ontario Association of Certified Engineering Technicians and Technologists (OACETT). 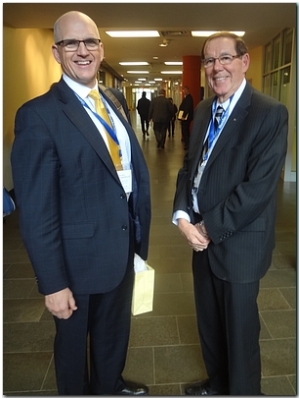 Minerva extends it thanks to Forum hosts Dr. Jeff Zabudsky, President & Vice-Chancellor, the Sheridan College Institute of Technology and Advanced Learning, and Dr. Iain McNab, Dean, Sheridan Faculty of Applied Science & Technology. “Having UBC host the first Minerva Learning Forum in B.C. was not only an honour but highlighted the changing attitudes of Universities and other Education Institutes with regards to their responsibilities for including health and safety as part of the academic experience. 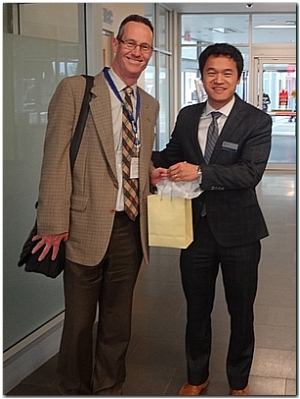 Bringing together educators, regulators and industry together proved to be a fruitful experience for all and will hopefully lead to more collaboration in the future.” – Richard Colwell, Safety and Facilities Officer, UBC Engineering, Faculty of Applied Science. “The Learning Forum was a great opportunity for on-site professional development for our faculty and technologists, and faculty and academic managers who attended are now better informed about the resources available from Minerva and more likely to integrate this material into their courses. 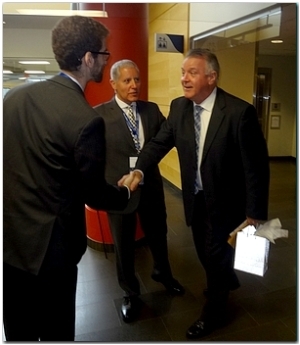 It also supported networking between faculty and guest speakers. There were a lot of business cards exchanged! And hosting the forum provided exposure for Conestoga College and our engineering diploma and degree programs.” – Julia Biedermann, Executive Dean, School of Engineering & Information Technology, Institute of Food Processing Technology, School of Trades & Apprenticeship, Conestoga College Institute of Technology & Advanced Learning. “The biggest value was engaging more faculty members, especially some of the key people, in a discussion that emphasized the need for health and safety education for our engineering students. The industry panel discussion helped the faculty members to better understand what safety education is needed. Schulich School of Business will be offering a course on engineering safety this winter, and I’m pleased that it will adopt some of Minerva’s materials available in the teaching modules.” – Anis Haque, Senior Instructor and Associate Head, Electrical and Computer Engineering Dept, University of Calgary. “Sheridan faculty members benefitted enormously from the event by knowing how advanced the Minerva Learning Modules are and also appreciate the fact that all the modules are free to access and use. 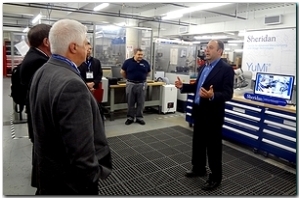 Attendees were also impressed by the industry and government support of Minerva’s programs. An additional benefit to hosting a Learning Forum at Sheridan is that it reinforces the notion that Canadian community colleges play a crucial role in educating post-secondary students about safety management systems. In many ways, safety education is potent aspect of the experiential and practical learning that takes place in institutions such as Sheridan.” – Daniel Liao, Manager, Chemical Labs, Sheridan College Institute of Technology & Advanced Learning, Davis Campus. Minerva Canada and the Chemistry Industry Association of Canada (CIAC) have teamed up to raise awareness of H&S through the launch of a competition. Undergraduate engineering students (in teams comprising one to four students) were invited to enter by preparing a written response to a case study on risk management prepared by Waterloo Cases in Design Engineering and hosted by Glencore. In order to enter, students addressed the problem provided in the case study through an analysis of the situation, identification of different options and recommendations on what course of action the company should take. 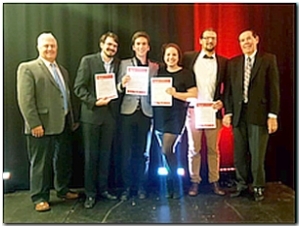 Three finalists were selected to present their solutions during the Process Safety Management Session on Monday, October 17 at the Canadian Chemical Engineering Conference in Quebec City at which the winning team was announced. Congratulations go to first place winners M. Gagnon-Dorval, O. Gazil, D. Leroux, and J. Tremblay-Martel.from l’Ecole Polytechnique who were awarded $500. In second place were K. Dritsas, K. Wei, A. Kostruba and K. Musalem from the University of Toronto and in third, T. Donnelly, D. Tu, A. Vasile, and W. Klanac of the University of Waterloo, who were awarded $300 and $200 respectively. A new case study for the Minerva- CIAC Responsible Care competition, along with the competition guidelines, will be sent to all Canadian Engineering Schools next summer by the Chemical Institute of Canada in advance of the 2017 Chemical Engineering Conference. 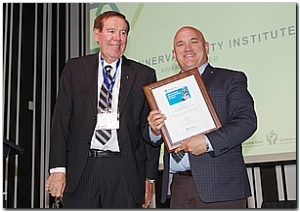 Congratulations go to Bob Masterson, President and CEO, Chemistry Industry Association of Canada (CIAC), this year’s recipient of the Minerva Education Award of Honour. The award, established in 2011, recognizes individuals from academia, government, industry and health and safety associations for their long-standing contributions to advance health and safety education in Canadian post-secondary teaching institutions. Prior to his current position, Masterson was VP Responsible Care for CIAC from 2010-2015. He was recognized for having initiated and delivered significant reforms to enhance the efficiency and effectiveness of Responsible Care activities, including education and the role that CIAC’s member firms could provide. A tireless Minerva supporter, Masterson has made numerous presentations at its Learning Forums and Summer Institutes, helped provide keynote industry speakers for and funded and sponsored Minerva’s educational programs. And he continues to support Minerva, including sponsorship of the new Responsible Care Case Study Competition Minerva- CIAC Responsible Care award for engineering undergraduate students from across Canada. 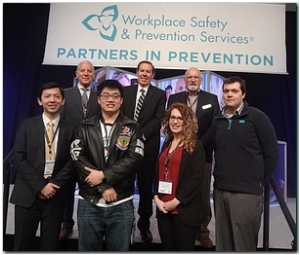 Minerva Canada honoured the 2016 winning student teams of its annual James Ham Safe Design Engineering Student Awards at the Workplace Safety & Prevention Services’ Partners in Prevention Conference in Mississauga, Ontario in April. The annual competition challenges Canadian university engineering students to make an original contribution toward integrating safety into engineering design. The award honours former University of Toronto President and Dean James Milton Ham whose Royal Commission Report on Health and Safety led to the creation of Ontario’s Occupational Health and Safety Act in 1979. Minerva: Why did you pick this particular project? Team: We sourced the idea from industry as it’s a problem. Even though there are requirements and regulations at a certain standard, workers can still get injured following the rules. Minerva: What do you hope people take away from your project? Team: To get in the right mindset and think in advance of trip hazards and potential falls. Minerva: What was your biggest take-away? Team: It gave us a taste of R&D and innovation for safety products. Minerva: What will you do with the prize money? Team: We want to take our product to a global scale and help everyone in the transportation industry. Minerva: What do you feel is the biggest value of an awards program like this? Team: It’s not only important for engineering students to know about safety but also good to show this kind of knowledge and awareness on your resume as a new grad. You can’t just show up in an interview with a spreadsheet on how you improved productivity. Safety knowledge gives you an edge. Second prize of $1,500 went to the team of Jeremy Wang, Ryan Williams, Shuyi Wu and Noah Yang, engineering undergraduate students at the University of Toronto, for designing an attachment for mop wringers (the PowerWring) that can assist in preventing lower back and repetitive strain injuries in the janitorial industry. Minerva: Tell us about your project’s background. Team: It evolved from a first year design project for the University Health Network where caretakers were reporting low back injuries. This is an area where there’s been no real innovation. Minerva: How did it feel to get this honour? Team: Because we put in a lot of work over a long period, the award proved our efforts were well placed and gave us recognition. It’s one thing to get validation from the university, but very special to get it externally from Minerva. Minerva: What do you hope people will take away from your project? Team: It’s never too early to think entrepreneurially. No one expected we would go this far. Also, the full range of innovation went into our project. Minerva: Do you think an awards program like this is valuable? Team: It shows students what is really important in the working world since health and safety is just a side note in engineering courses. We also want to show them that their work can lead to something and that it’s important to look for innovation in all areas and expect to make a difference. Minerva: What are your next steps? Team: We want to talk to companies and move forward to implement our design and see it help people and have an impact on their lives. We will do more prototyping with the prize money and have applied for a patent. Another university team deserved an honorable mention during Minerva’s review of the submissions for this award. The University of Waterloo engineering team of Dena Arghastani, Mahdi Mahdi, Brant Wunderlich and Peter VanderMeer conducted a very thorough hazard analysis and dispersion modeling in arriving at a design solution to mitigate and reduce the potential risk of an ammonia release from a chemical processing facility in Canada. Students interested in entering the 2017 competition should visit www.safetymanagementeducation.com/james-ham-safe-design-awards/ for rules, entry form and important dates. 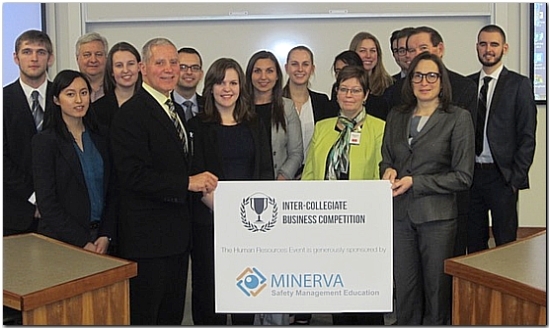 Teams from the University of Regina, Queen’s and Saint Mary’s universities clinched the top three spots in the Minerva-sponsored Health and Safety Human Resources event at this year’s Inter-Collegiate Business Competition (ICBC) held at Queen’s University. ICBC is Canada’s oldest and longest-running undergraduate business case competition, featuring eight different competitive events in which students can compete annually. It attracts close to 250 attendees, including competitors from around the world as well as judges, faculty advisors, student organizers and volunteers from over 40 universities and 10 countries. Minerva Board members Deborah McPhee, Nina Mankovitz, Peter Sturm, Larry Masotti, and Tony Pasteris judged this year’s six presentations in the Human Resources Venue. Brock University and the University of Windsor are preparing case studies for the 2016-17 competition. The 2015-16 ICBC case studies sponsored by Minerva Canada are on our website. Congratulations to year’s winner, USG Corporation, a manufacturer of innovative, high-performance building systems, recognized for its outstanding environmental, health and safety programs. The award selection process includes rigorous assessments such as site visits and comprehensive evaluations of an organization’s integration of its EHS management system and the impact it has on the bottom line. The award is promoted by an international partnership of 21 organizations, including Minerva Canada. It seeks nominees worldwide and, this year, Minerva’s Board members Tony Pasteris and Peter Sturm judged preliminary submissions. For more, visit www.thecampbellinstitute.org. 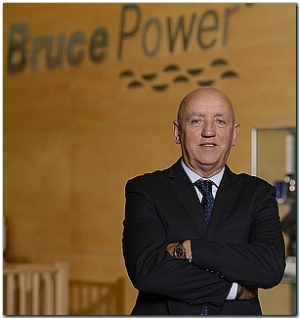 Duncan Hawthorne, President and Chief Executive Officer, Bruce Power, announced his retirement earlier this year. A champion of health and safety in the workplace, he helped ensure that Bruce Power consistently delivers strong safety and operational performance for the benefit of its customers and employees. A tribute video of Duncan’s contributions Health and Safety was shown at the April 2016 Partners in prevention Conference. Campbell Institute 2016 Symposium, February. Queen’s engineering first year design course, APSC 100, student presentations of innovative solutions to preventing the multiple fatalities described in Minerva’s Levack Mine case study. Minerva Board Member Vic Pakalnis of MIRARCO acted as one of three judges, April, Kingston. National Council of Deans of Technology (NCDoT) meeting, May, Toronto. CEO Health and Safety Leadership Network Spring Conference – Minerva board members Tony Pasteris, Larry Masotti, Graeme Norval, Vic Pakalnis and Peter Sturm attended and provided support. Each Minerva member sat with different business leaders and was involved in the idea exchange, bringing a perspective that was shared with this elite group of business leaders, April, Toronto. Technology Accreditation Canada meeting, May, Toronto. Campbell Institute Benchmarking Conference, June. British Columbia Institute of Technology, September, Burnaby, BC. Canadian Society of Safety Engineering (CSSE), September, Vancouver. Board of Canadian Registered Safety Professionals (BCRSP), September, Vancouver. Conference Board of Canada HSLC workshop September, Toronto. Campbell Institute Award presentation, October. First year Engineering student seminars, University of Toronto, November. President, R. Dalla Via Environmental Health and Safety Consulting Ltd.
A heartfelt thank you is extended to outgoing Board members Ayumi Bailly and Ana Matos-Clark from the Ontario Ministry of Labour, Steve Horvath, President & CEO, Canadian Centre for Occupational Health & Safety and Jim Hopkins, Chief Safety Officer, OC Transpo. Minerva Canada greatly appreciates all the time and effort all of them have put in to improving the organization and making healthy and safe workplaces a stronger focus in post-secondary education. Minerva welcomes Jules Artnz-Gray of the Ontario Ministry of Labour, Iain McNab of Sheridan College and Kathy Tull of WordSafeBC to our Board. We look forward to their contributions towards further strengthening Minerva Canada. Minerva Canada will soon publish separate marketing materials/brochures, each targeted to our academic, student, industry, and government audiences. Stay tuned! A collaborative undertaking between Minerva Canada and Saint Mary’s University in Halifax, the “Managing the Gap” project examined the current extent of occupational health and safety (OH&S) content in Canadian university business curricula. In addition to reviewing formal course descriptions, it also surveyed business professors about their teaching of OH&S and industry representatives about the need for OH&S education from business graduates they hire. Minerva should urge an accrediting body such as the Association to Advance Collegiate Schools of Business (AACSB) to adopt OH&S content as a requirement. Minerva could prepare guides for professors in specific content areas (e.g., accounting, economics, marketing, etc.) that describe how OH&S is relevant for their students and how it is related to their current course material. Minerva could work with individual professors from disciplines that do not typically teach OH&S content to identify specific means through which it could be made relevant. Minerva has begun to implement some of the report’s recommendations and using business professors to do the work. More information will become available on Minerva’s website as new educational material is developed for business professors. A case study on risk management was created for the new Minerva-CIAC Responsible Care Case Study Competition held in the fall at the annual CSChE Conference in Quebec City. Glencore Canada assisted the University of Waterloo to prepare the case study. An Event Tent Rentals Case Study prepared for the 2016 Inter-Collegiate Business Competition (ICBC) finals is posted on our website and two additional case studies are in the works for the 2017 ICBC competition.